Background Providing the correct diagnosis for patients with tubulointerstitial kidney disease and secondary degenerative disorders, such as hypertension, remains a challenge. The autosomal dominant tubulointerstitial kidney disease (ADTKD) subtype caused by MUC1 mutations (ADTKD-MUC1) is particularly difficult to diagnose, because the mutational hotspot is a complex repeat domain, inaccessible with routine sequencing techniques. Here, we further evaluated SNaPshot minisequencing as a technique for diagnosing ADTKD-MUC1 and assessed immunodetection of the disease-associated mucin 1 frameshift protein (MUC1-fs) as a nongenetic technique. Methods We re-evaluated detection of MUC1 mutations by targeted repeat enrichment and SNaPshot minisequencing by haplotype reconstruction via microsatellite analysis in three independent ADTKD-MUC1 families. Additionally, we generated rabbit polyclonal antibodies against MUC1-fs and evaluated immunodetection of wild-type and mutated allele products in human kidney biopsy specimens. Results The detection of MUC1 mutations by SNaPshot minisequencing was robust. 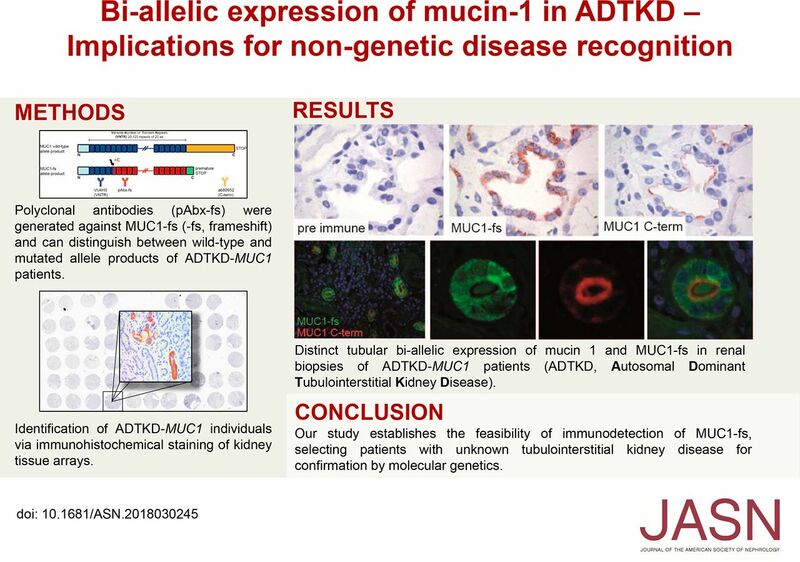 Immunostaining with our MUC1-fs antibodies and an MUC1 antibody showed that both proteins are readily detectable in human ADTKD-MUC1 kidneys, with mucin 1 localized to the apical membrane and MUC1-fs abundantly distributed throughout the cytoplasm. Notably, immunohistochemical analysis of MUC1-fs expression in clinical kidney samples facilitated reliable prediction of the disease status of individual patients. Conclusions Diagnosing ADTKD-MUC1 by molecular genetics is possible, but it is technically demanding and labor intensive. However, immunohistochemistry on kidney biopsy specimens is feasible for nongenetic diagnosis of ADTKD-MUC1 and therefore, a valid method to select families for further diagnostics. Our data are compatible with the hypothesis that specific molecular effects of MUC1-fs underlie the pathogenesis of this disease.